The Hellenic Restaurant on level 5 will be closed until further notice. We apologise for any invonvenience caused. 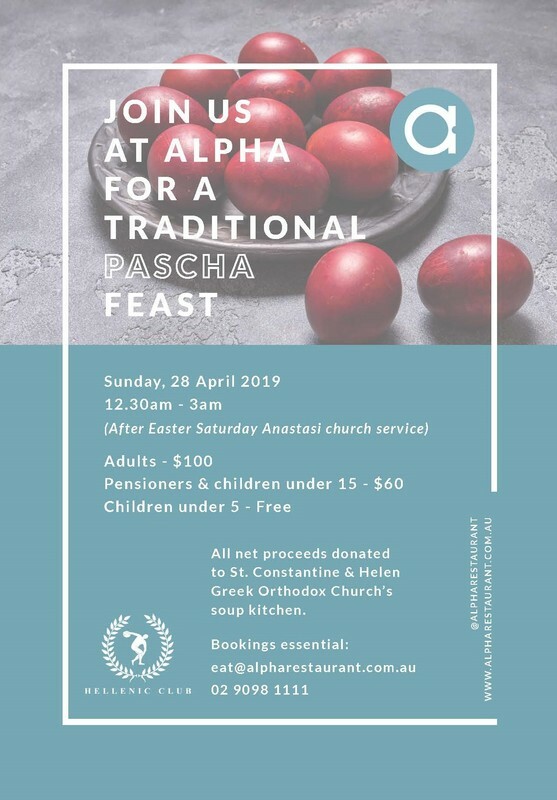 The Hellenic Club, is pleased to invite you to join us for the traditional Pascha feast at Alpha Restaurant after Easter Saturday Anastasi Church Service on 28 April 2019 from 12:30am - 3:00am. The Hellenic Club is set to welcome a record-sized contingent of the Greek Presidential Guard, known as the Evzones, to the city in April in honour of ANZAC Day. The visit will mark the third consecutive year that the Club has hosted the elite ceremonial contingent, travelling from Greece to mark this important day of remembrance for both countries. Join us for an exclusive dinner on Tuesday March 27, as we take you to Crete for the night. 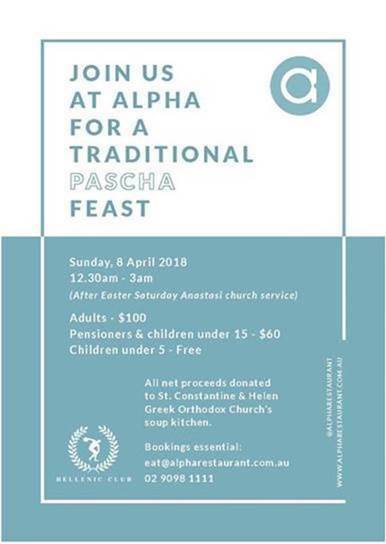 The Hellenic Club is pleased to invite you to join us for the traditional Pascha feast at Alpha Restaurant after Easter Saturday Anastasi Church Service on 8 April from 12:30am - 3:00am. 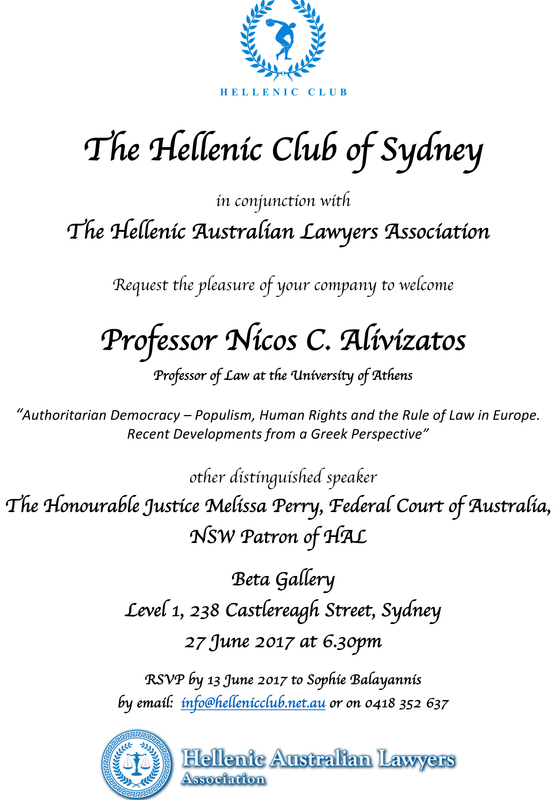 The Hellenic Club Sydney in conjunction with the Hellenic Australian Lawyers Association NSW invites you to an event to welcome Professor Nicos C. Alivizatos, Professor of Law at the University of Athens. After a successful visit in 2016, the Hellenic Club Sydney will host nine soldiers of the Greek Presidential Guard, or Evzones, to commemorate Anzac Day and the 76th anniversary of the Battle of Crete. The Hellenic Club Sydney was delighted to host a lunch honouring Greek-Australians who have excelled in their contributions to the NRL. Visiting Adelaide from April 19-23 and Sydney from April 23-May 3, we are looking forward to sharing this momentous occasion with you all. 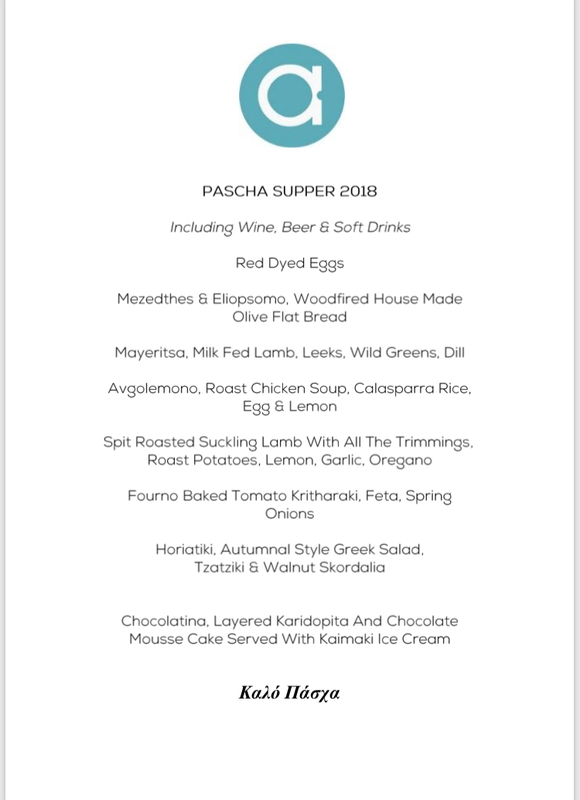 The Hellenic Club Sydney invites you to enjoy a traditional Pascha supper. Enjoy Alpha's private dining menu in the spectacular Beta setting. You will savour a selection of traditional Easter dishes assembled by our celebrated executive Chef Peter Conistis’, the Godfather of Greek Food in Australia. The net proceeds from the feast will be donated to the St Constantine & Helen Greek Orthodox Church (and Reverend Nektarios Zorbalas) for their community kitchen which provides nutritious meals in a safe and caring environment to those most in need. Please see the full menu which is attached. We want to thank you for your support, and we look forward to celebrating with you at the Feast. A booking form is attached for your convenience. Alternatively you may book through the Eventbrite link on our website – www.alpharestaurant.com.au. Released by special permission of the President of Greece, 12 Evzones will pay tribute to the ANZACS and reflect on their nation's involvement in the Battle of Crete and the Greek Campaign. The Hellenic Club will also host the ANZACS of Greece invite-only annual luncheon at its spectacular CBD event space, Beta Bar and Gallery Sydney on Tuesday 24 April. “This is a wonderful opportunity for Greek Australians to honour the ANZACS and for all Australians to discover more on the historical significance of the ANZACS in Greece,” Arthur Balayannis, CEO of the Hellenic Club said. The visit comes under the auspices of the Consulate General of Greece in Sydney, and is proudly supported by the Joint Committee for the Commemoration of the Battle of Crete and The Greek Campaign, the Australasian Hellenic Educational Progressive Association (AHEPA), and other benefactors. Please click on this link to see the Public Program of their visit. Join us for an exclusive dinner on Tuesday March 27, as we take you to Crete for the night. Cretan cuisine is renowned for its unique ingredients grown or produced on the island, including dittany herb and anthotyro cheese, and dishes such as dakos and xerotigana fried pastries. 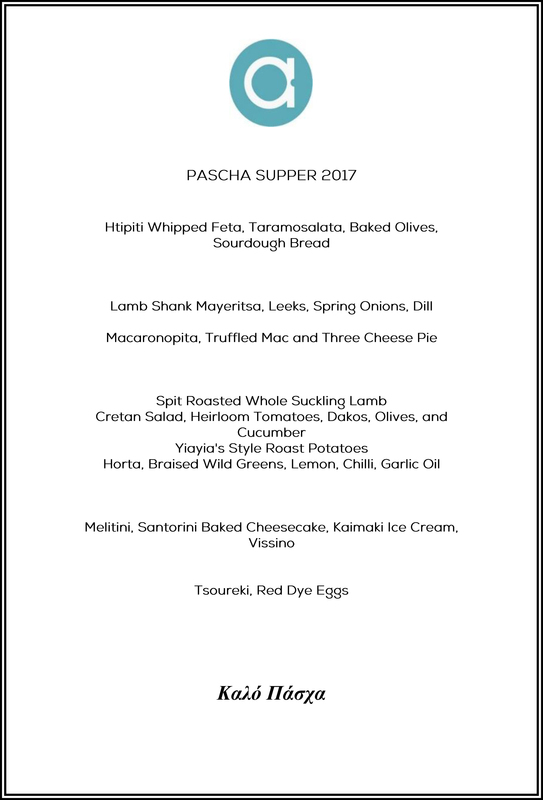 Guests will enjoy a delicious four-course meal created by Executive Chef Peter Conistis, with matching wines for $110 per person. 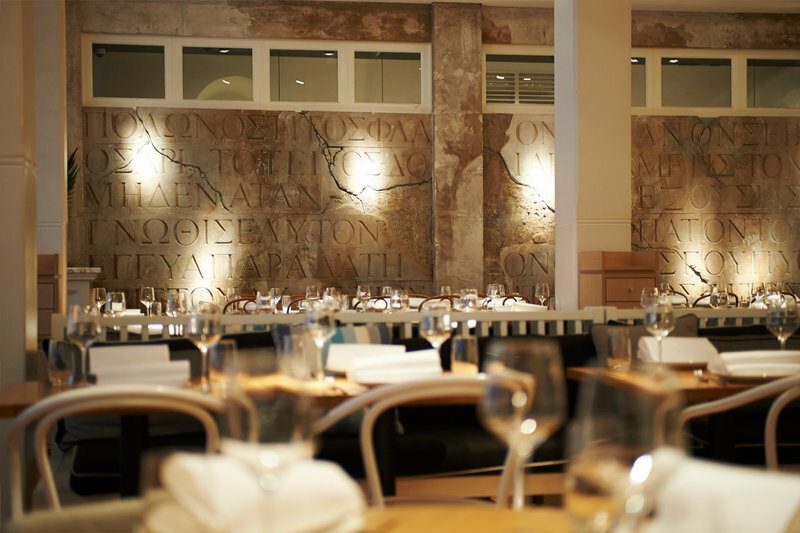 To book, either email eat@alpharestaurant.com.au or phone 02 9098 8111 and mention the Cretan Dinner. You will savour a selection of traditional Easter dishes assembled by our celebrated executive Chef Peter Coinistis, the Godfather of Greek Food in Australia. The net proceeds from the feast will be donated to the St Constantine & Helen Greek Orthodox Church (and Reverend Nektarios Zorbalas) for their community kitchen which provides nutritious meals in a safe and caring environment to those most in need. We want to thank you for your support and we look forward to celebrating with you at the Feast. Please contact the Alpha Restaurant team on (02) 9098 1111 or email eat@alpharestaurant.com.au to make a reservation or if you have any questions. Professor Alivizatos will speak on “Authoritarian Democracy – Populism, Human Rights and the Rule of Law in Europe. Recent Developments from a Greek Perspective”. The NSW Patron of HAL, The Honourable Justice Melissa Perry, Federal Court of Australia, will also speak. The event will be held at the Beta Gallery, Level 1, 238 Castlereagh Street, Sydney, on 27 June 2017 at 6.30pm. RSVP by 13 June 2017 to Sophie Balayannis by email: info@hellenicclub.net.au or on 0418 352 637. Nine Evzones – the soldiers of the Greek Presidential Guard – will visit Sydney to commemorate Anzac Day. 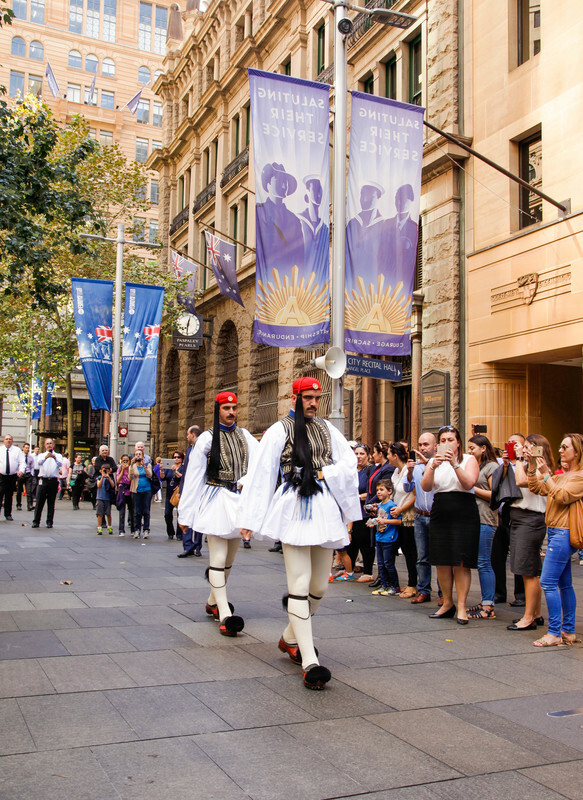 Released by special permission of the President of Greece, the Evzones will visit Adelaide and Sydney to take part in the official ANZAC Day ceremonies, celebrating the role of the soldiers of Greece and Crete, often known as the ‘forgotten ANZACs’. 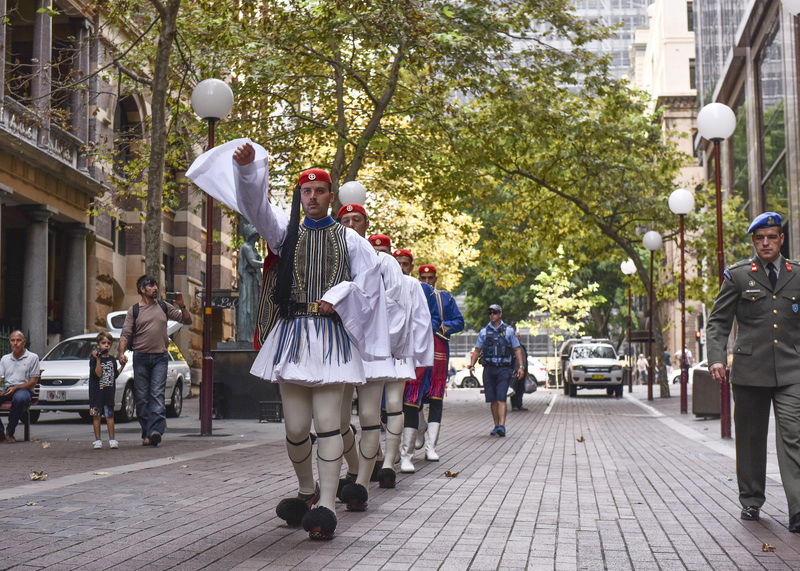 The Evzones will join the Allied Forces for Sydney's Anzac Day March, and form a Guard of Honour at the Martin Place Cenotaph from 1-2pm on April 28 and 29. The Evzones’ arrival in Sydney on April 24 will follow a historic four-day visit to Adelaide, organised by the Foundation for Hellenic Studies and supported by the South Australian Government. Official events in Adelaide will include a march to the city’s War Memorial and a pre-game flag-raising ceremony at Adelaide Oval for the AFL Anzac Day round between Port Adelaide and Carlton. The defense of Greece by the ANZACs and other Commonwealth forces is recognised by historians as one of the major contributions to the Second World War, significantly delaying the Nazis’ invasion of Russia. For the final programme of the Evzones' visit to Sydney, see below. 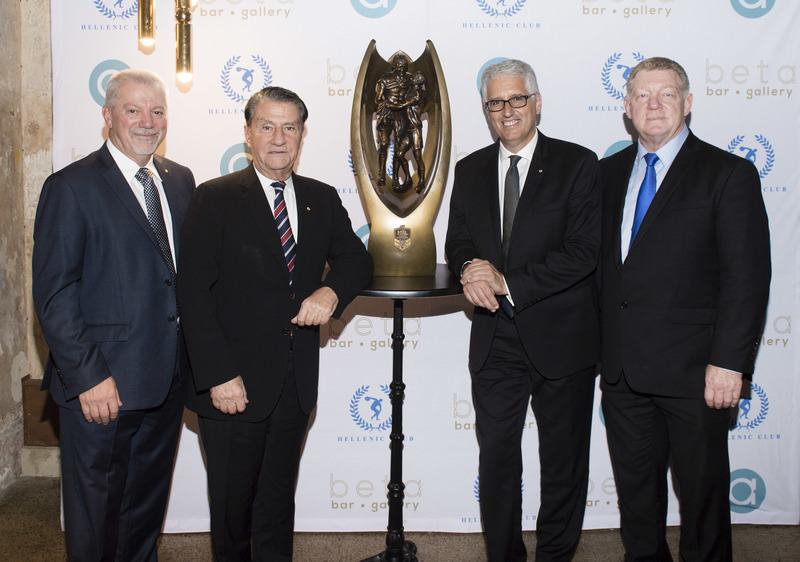 Hosted at the Club's newly-established Beta Bar & Gallery, above the acclaimed Alpha Restaurant, the Club celebrated the achievements of NRL leaders Nick Politis AM, Chairman of the Sydney Roosters, Dr George Peponis OAM, former Australian captain and Chairman of the Canterbury-Bankstown Bulldogs, and Nick Pappas AM, Chairman of the South Sydney Rabbitohs. Respected former player and NRL identity, Phil Gould AM chatted with the guests of honour about their successes in the NRL, while guests dined on a menu prepared by Alpha’s renowned Executive Chef, Peter Conistis, and a selection of Greek wines. Net proceeds from all ticket sales were donated to The Hellenic Initiative, a global not-for-profit organisation that works to assist Greece through crisis relief, entrepeneurship and economic development. To view the video honouring the guests, click here. 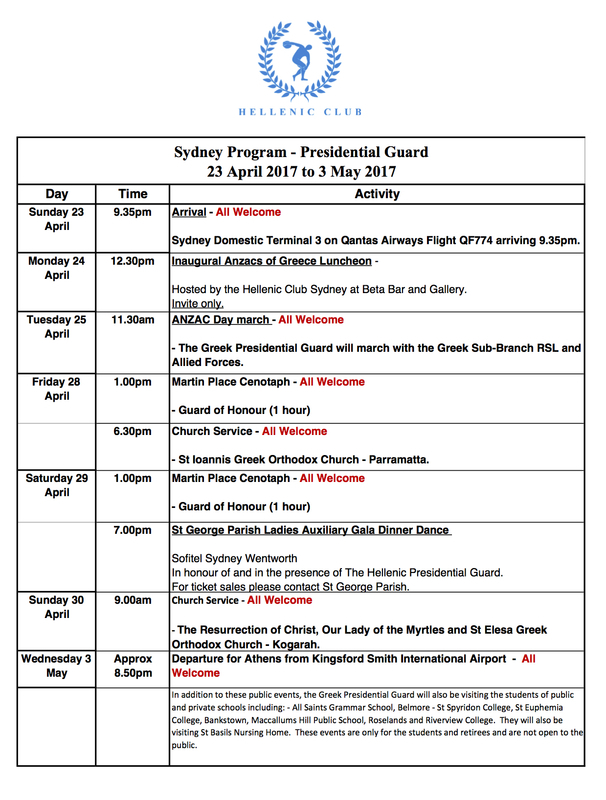 The Hellenic Club Sydney is honoured once again to announce the impending visit of the elite Presidential Guard of Greece. The contingency of nine Evzones and two officers has been released by special permission of the President of Greece, and will visit the city of Adelaide from 19th April to 23rd April and Sydney from 23rd April to 3rd May. The Evzones will take part in official ANZAC Day ceremonies, commemorate the history of the ANZACs, and their involvement in the Battle of Crete and Greek Campaign, when Australian and Greek soldiers fought side by side for our shared values of freedom and democracy. 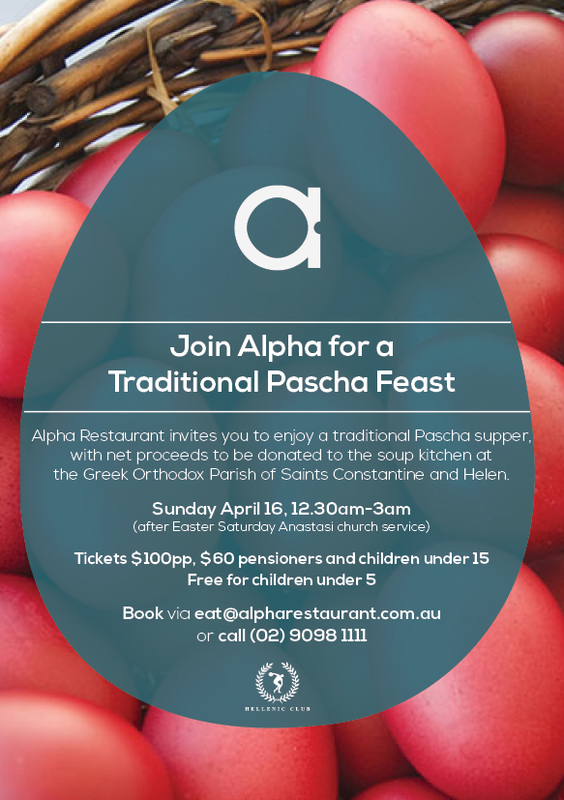 Join us for a traditional Greek Pascha Feast at Alpha Restaurant, with proceeds to be donated to the soup kitchen at the Greek Orthodox Parish of Saints Constantine and Helen. Sunday April 16, 12:30am-3am (after Easter Saturday Anastasi Church Service). Tickets are $100 per person, $60 for pensioners and children under 15, free for kids under 5. Book via eat@alpharestaurant.com.au or call (02) 9098 1111. Alpha's private dining experience is now available at Beta, on level one. For lunches only, Beta bar can accommodate 20-40 people, while bookings of 40-60 can be hosted in the spectacular gallery. Guests will dine on Alpha's $85pp or $95pp private dining menus, created by Executive Chef Peter Conistis. Beverage packages and beverages on consumption can be arranged. Bookings are available from 12pm, and tables will need to be vacated by 4pm.